Copyright © 1997 by Catherine Palmer. All rights reserved. Cover photograph copyright © 2000 by Paul and Linda Marie Ambrose/FPG. All rights reserved. , New Living Translation, copyright © 1996. Used by permission of Tyndale House Publishers, Inc., Carol Stream, Illinois 60188. All rights reserved. 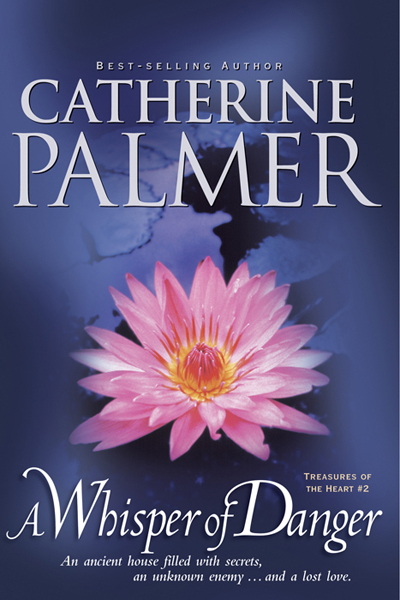 A whisper of danger / Catherine Palmer. 1. Inheritance and succession—Fiction. 2. Mothers and sons—Fiction. 3. Zanzibar—Fiction. I. Title. II. Series. This book is dedicated to Geoffrey Palmer, my beloved son. on’t store up treasures here on earth, where they can be eaten by moths and get rusty, and where thieves break in and steal. Store your treasures in heaven. . . .Wherever your treasure is, there your heart and thoughts will also be. Sounds of gurgling and choking mingled with the dull thuds of Spencer Thornton’s agonized death throes. Jess shook her head. Drowning. What an awful fate. She reached the attic door and leaned against it, listening. From the other side came a loud gasp, a weak moan, and the crash of a heavy object falling onto the attic floor. Jess stepped over a box of broken Christmas balls and squinted. In the faint light coming through a round window in the gable she could just make out the thin body of a boy dangling by his skinny arms from a horizontal collar beam. Legs flailing, he was attempting to haul himself onto the wooden rafter. One end of a vacuum-cleaner hose flopped around his head; the other end was attached with silver duct tape to a football tied to his back. Jess glanced at the wobbly chair her son had indicated. Then she looked up at the dusty, web-coated collar beam. After kicking off her sandals, she climbed onto the chair and hiked up her jeans. She grabbed the beam, swung one leg over it, banged her knee, and nearly toppled over before righting herself. Jess studied her son. His violet eyes were the mirror image of her own, but where her hair glistened with red fire, the gold of sunshine danced in his. All arms and legs, he had lost the soft curves that once had made him cuddly. Now he was ropy and thin, with broad shoulders, the hint of a man’s square jaw, and smooth skin stretching across high cheekbones. Splinter had been gifted with near-genius intelligence, and creativity seemed to ooze from his every pore. Yet he was all boy. Anything dirty, hidden, explosive, or smelly held him in rapt fascination. He spent hours sketching treasure islands and building models of spaceships from paper clips and empty toilet-tissue rolls. If something could be swum in, Splinter swam in it. If something could be climbed on, Splinter viewed it as a personal Everest. He wore holes through his socks, regularly stained the knees of his jeans green, and never had two matching gloves. Jess stared into her son’s eyes, dismayed at the light of hope burning there. For ten years she had blocked her son’s father out of her mind. As Spencer had grown, she had painted for the child a vague picture of a faceless, ephemeral man who was neither good nor bad, a man who had vanished like the mist on a sunny morning. It was clear that the boy had mentally connected Africa with his father. Jess would have to blot out that notion. She would do it carefully but firmly. Just as firmly as she always shut the door on her own bitter memories.